April 6, 2010 - TKS anti-icing fluid is being used in a variety of platforms to provided anti-/deicing capability for smaller commercial aircraft. This fluid is applied to critical surfaces (propeller, wing and tail leading edges), is spread by aerodynamic forces via a type of installed sleeve, and removes or prevents the buildup of ice through fluid freeze point depression. The fluid is stored onboard these aircraft in quantities of approximately 5-10 gallons. In prior certifications of TKS systems on board aircraft, the issue of fluid flammability was not a concern, the fluid was simply considered to be non-flammable. However, recent testing has shown that the fluid is in fact flammable under certain conditions. The flammable liquid is comprised of 85 percent ethylene glycol, 10 percent water, and 5 percent isopropyl alcohol. Glycol/water solutions have been known to cause hazardous conditions when exposed to wiring and circuits containing silver or oxides of silver. This hazard is presumably already controlled through separation of such entities for the aircraft types associated with this equipment. Some additional concerns about the flammability hazards associated with the storage and use of this fluid on aircraft have been raised. These hazards include, but are not limited to, the heating of small puddles of fluid that were either spilled or leaked, dripping of the fluid on hot surfaces, and the contact of the fluid mist with ignition sources. Before more time-consuming and expensive flammability testing were pursued, simple tests were performed to allow for more basic characterization of the TKS anti-icing fluid flammability. The flash point of TKS anti-icing fluid is reported in the material safety data sheet (MSDS) as 53°F, which is also the flash point of isopropyl alcohol. It seemed unusual that the flash point would be the same as isopropyl alcohol when the mixture is 85 percent ethylene glycol, which has a reported flash point of about 230°F. Mixtures of ethylene glycol and water are generally accepted to have no flash point, although the mixture is only 10 percent water. To clarify these discrepancies, the ASTM D 56-87 Tag Closed Cup flash point tester was used to determine the flash point of the fluid. Due to the unusual nature of the fluid, several different starting and ending temperatures were used. More advanced boiling point inhibitors were used to control the bath temperature to allow higher fluid temperature behaviors to be observed. Reaction criteria were reviewed in the context of this particular fluid. To help assess the hazards posed by the fluid when quantities gather in a puddle, such as a leak or spill in a bay area, a 2- by 2-foot pan filled with 1/4 to 1/2 inch of the fluid was heated from the bottom with a propane burner. The vapor was exposed to a spark every 10°F to determine if and when the pan would sustain a pool fire or if the vapors would ignite at all. The intensity/severity of the observed reaction and/or burning and temperatures of the fluid and vapor were recorded on videotape so they could be characterized. To help assess the hazards posed by the TKS fluid when small quantities leak in the presence of hot equipment, various quantities of the fluid were deposited on a hot plate. Using a needle valve under a small fluid reservoir, the fluid was allowed to drip onto a small 700°F steel plate. Flow rates varied from several drops per second to as little as less than one drop per second. The steel plate was heated by an electric coil burner. Any observed reaction, fire or flame, was documented. To help assess the hazards posed by the TKS anti-icing fluid when stored under pressure in the presence of hot equipment, the fluid was sprayed into small droplets and exposed to an ignition source at ambient pressure and temperature conditions. 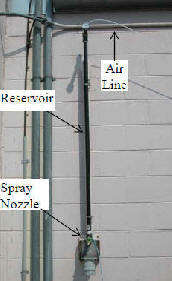 The fluid was spayed by pressurizing a reservoir to 20 and 40 psig and feeding the fluid through a misting nozzle. The outside air temperature was between 70° and 90°F, and the air pressure was approximately standard ambient sea level pressure (29.92 inches Hg). The ability to ignite the mist when exposed to a flame and a spark was examined as well as the ability of the mist to hold a flame without an ignition source and flashback to the spray nozzle. The behavior of any observed fire was recorded on videotape and characterized. 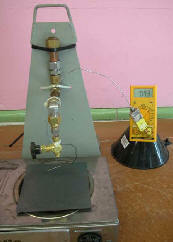 Figure 1 shows the hot-surface test apparatus and the spray flammability tester. Results The Astm Flash Point Test. When performing the flash point test on the TKS anti-icing fluid per the ASTM D 56-87 standard with the Tag Closed Cup flash point tester, a reaction consistent with the reaction criteria given in the standard was observed between 140° and 150°F. This reaction consisted of a small, but distinct, blue flame that quickly appeared in the observation window of the tester. Alcohols generally have low flash points, but given the mixture is only 5 percent isopropyl alcohol, this low reaction temperature was not expected. When the test was continued at higher temperatures, no blue flame was observed, but when testing for a flash, the vapors consistently extinguished the test flame, which could be evidence of a fast reaction taking place with no other observable features (blue flame). The fluid was further heated to approximately 250°F. At about 240°F, the cup tester would hold a flame on top of the tester when the test flame was applied and continued to hold the flame when applied for the remainder of the test. No violent reactions (puffs or pops from the tester) were observed. This test was performed three times with the flame observed at 140°-150°F on one test. The other two tests exhibited the same potential fast reaction behavior at approximately 140°-150°F with no blue flame observed. When the 2- by 2-foot pan of TKS anti-icing fluid was heated sufficiently from the bottom with a propane burner and an ignition source was applied, it would sustain a pool fire. On two separate occasions when the fluid was between 250° and 260°F, a self-sustaining, low blue fire was initiated on top of the fluid. On one occasion, this fire was started by a spark source located 1-2 inches above the pan fluid level. On a second occasion, the pan fire started without applying a spark. Review of the video showed that the fire was started by a stray flame from the propane burner, which had a large flame plume that would sometimes envelop the pan. On both occasions, when the heat source and spark were removed, the fire was self-sustaining and showed no signs of self-extinguishing or diminishing. 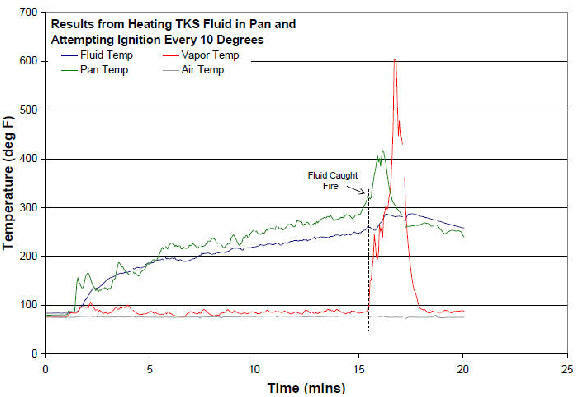 Figure 2 gives the temperatures measured during the second test and clearly shows the 250°F fluid temperature at which the pan caught fire, as indicated by the sharp rise in vapor temperature. Figure 2 also illustrates the relatively cool temperature at which the fluid burned. The maximum temperature observed (12 inches above fluid) was approximately 600°F. Also, on both occasions, a spark was applied at a slightly lower temperature (approximately 240°F) and no fire or flame was observed. The fire was extinguished with a generous amount of carbon dioxide. It should be noted that with the pan temperature still above 260°F and the heat source removed, a spark would not re-ignite the pan a full minute after the fire was extinguished. No flame or reaction was observed when small amounts of the TKS anti-icing fluid were dripped onto the hot plate surface. The plate temperature was varied from 250° to 700°F. With the plate at 700°F, the flow rate was varied from a slow drip to a small steady stream. Although the fluid generally vaporized on contact, no fire or flame was observed. When high flow rates were used with plate temperatures in excess of 600°F, small quantities of the fluid would build up under the hot plate below the radiant coil heater in the burner assembly, which would eventually create a reaction under the plate with a pressure wave and a blue flame front (pop). This is an indication of the relatively low autoignition temperature (reported at 750°F) typical of all alcohols and glycols and is not a demonstration of hot-surface ignition. This is expected as temperatures below the plate were probably greater than 750°F. When sprayed as a fine mist under pressures of 20 and 40 psig, the TKS anti-icing fluid reacted when exposed to an open-torch flame (see figure 3) and began to burn with an orange flame. Reactions from the torch occurred consistently when the torch was applied at a variety of distances from the spray nozzle but did not always occur if the torch contacted some mist. The mist would not continue to burn with the torch removed, and the flame front never traveled back to the nozzle regardless of the pressure or distance at which the torch was applied. When a spark was used as an ignition source, it created some sporadic ignitions of the fluid, but only when the spark was positioned in a small area near the middle of the spray with the high-pressure spray setting. As expected, TKS anti-icing fluid is flammable under the correct conditions. The flash point of the fluid is much greater than reported in the MSDS, but is still relatively low (~150°F), and appears to have a very low energy release when reacting. The fluid will burn when heated in a pan to approximately 250°F and subjected to an ignition source, but burns relatively cool. When dripped onto a hot surface, the fluid does not react but will probably display relatively violent characteristics if heated in a confined space above 750°F (approximate autoignition temperature). The fluid mist will burn at ambient temperature and pressure, but will not sustain a reaction when the ignition source is removed. Only sporadic ignitions (no fireball) were observed when the mist was ignited with a spark, and these were confined to small patches of mist close to the center of the spray. The FAA has issued a Special Airworthiness Information Bulletin (SAIB) alerts type certificate, amended type certificate, and supplemental type certificate applicants of an airworthiness concern regarding the issue of fluid flammability for TKS fluid. At this time, this airworthiness concern is not considered an unsafe condition that would warrant an airworthiness directive action under Title 14 of the Code of Federal Regulations (14 CFR part 39).